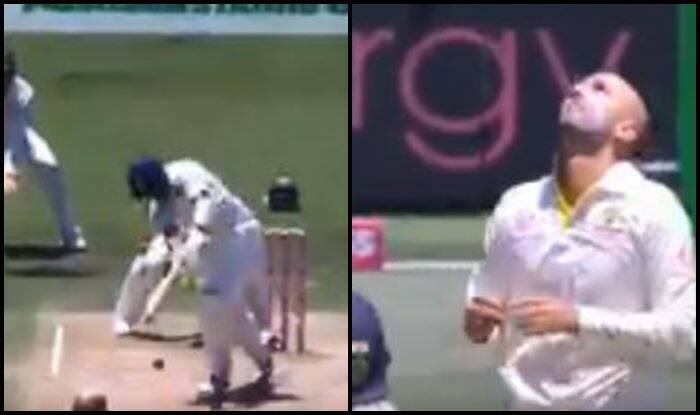 Australia vs India 4th Test Sydney: It was Nathan Lyon who finally brought an end to Cheteshwar Pujara's marathon 193. Australia vs India 4th Test Sydney: It was Nathan Lyon who finally brought an end to Cheteshwar Pujara’s marathon 193. Pujara looked all set to bring up his fourth double century and that is when he was caught and bowled by Lyon. It was also Lyon’s 15th caught and bowled in his career. But the Indian innings was anchored by Pujara as he has done all through the Australian summer. Pujara got a rousing reception from the SCG crowd as some Australian cricketers also walked up to him to laud his knock and so did Rishabh Pant. It was also his third century of the series and both the previous ones have come in winning causes at Adelaide and Melbourne and he would be hoping the same with his marathon 193. The Saurashtrian became only the third India batsman to score 500+ runs in a Test series in Australia. He joined Virat Kohli and Rahul Dravid to this feat. Lyon accepted a rather simple return chance and Khawaja will breathe a sigh of relief, having dropped him on 192. Good gesture from Khawaja as he pats Pujara on the back while he was trudging off. Pujara also surpassed Rahul Dravid to face the most number of balls by an Indian batsman in a Test Series in Australia. Pujara’s long vigil finally came to an end on 193 when he was caught and bowled by Nathan Lyon, he missed out on what would have been a historic double century.